THIS FRAME IS ON BACKORDER until approximately 5/24. Orders will be placed on hold until we get more inventory. Apologies for this delay. 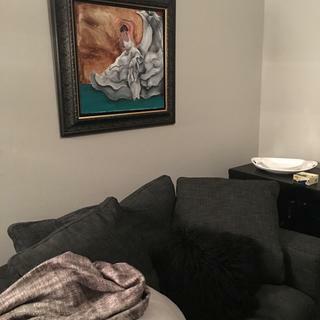 This canvas float frame fit wonderfully around a canvas artwork from Etsy. It took an inexpensive piece and made it a work of art in our home. I couldn't be more pleased with it and plan to order other items from this site!!! Color and style worked with existing painting. It looks like good quality workmanship and I believe it will enhance my art work. The rabbet dimension is cited as 1 inch, but the item description states it will fit canvases up to 1.5 inches deep. 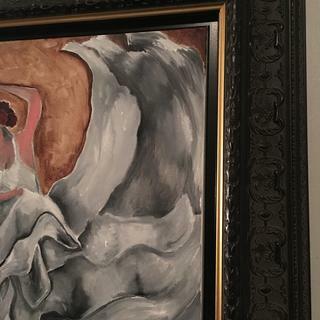 Please explain, as I doubt a painting would look good that sticks out 1/2 inch from the frame? BEST ANSWER: Hi Emily. We appreciate you considering us for your framing needs. The rabbet depth of the frame is 1",however, if the canvas is 1 1/2" that will work with the frame. The canvas will only slightly protrude. Of course we want you to be comfortable with the visual appearance of the canvas in the frame. We suggest that you please order a sample to see how the canvas will sit inside the frame. With the difference of your canvas and frame being 1/2" the canvas will not be completely flush. If you have any additional questions, please let me know. Have a wonderful day! I want to frame a 36"x24" tri panel canvas (each panel is 12x24). Do you have/make a frame for tri panel art? BEST ANSWER: We do not, but I would be interested to see an example of what you are talking about. I am looking for a wood float frame for canvas 24 x 36” Do you have one? Take a look at https://www.pictureframes.com/Wood-Picture-Frames?c=canvas-floater for all of our canvas wood frame options. If you have any additional questions do not hesitate to contact our friendly framing experts at 1-800-332-8884 or via LIVE chat. I really love this frame, but I have a 16x20 photo I want to put in it. Can I get this frame for a picture? BEST ANSWER: Yes we do! The RR4 is the non-floater version of this frame. 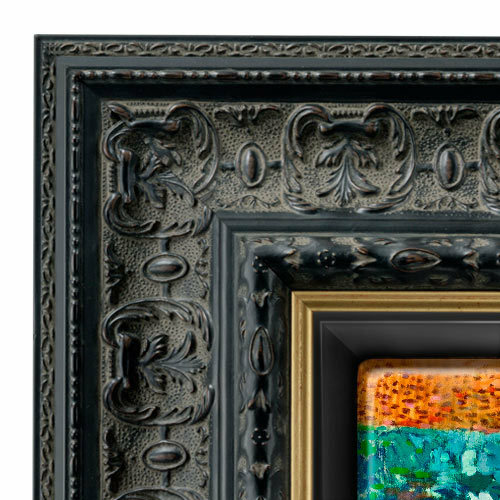 https://www.pictureframes.com/Custom-Frames/Renaissance-Handcrafted-Wood-Picture-Frames/RR4-black-with-gold-ornate-frame Just order the acrylic and backing to finish it off and you are good to go. Are there any large frames but not like posters at least with 2 or more inches on the outside 24x36 and 24x30? BEST ANSWER: Yes we sell wide picture frames, here is a link for some options that are 2 1/2" to 3 1/2" wide: https://www.pictureframes.com/Wide The majority of our frames are custom and can be ordered in 24x36 as well as 24x30. The sizes you listed are also available in many of our ready made frames. The RRF4 frame is, however, for canvas and would not work with a print or something that may require acrylic or glass to hold it in the frame. will this frame work for a 3/4"deep stretched canvas? BEST ANSWER: Hello! Yes, the frame will work with a 3/4" canvas, however, the depth/rabbet of the frame is 1 1/2". The canvas will recess in the frame by 5/8" but the frame will work the canvas. Reference masonite: If I add a 1" spacer will this frame work? BEST ANSWER: Hello! This exquisite frame is designed to support canvas only and will not support a 1" spacer. If you are seeking a frame that does support a spacer, please consider the frame below with the same characteristics. If you need further assistance, please give us a call at 1-800-332-8884.
what is the widest traditional wood frame you have ? BEST ANSWER: Hello! Our widest frames are 4" just as this beautiful frame you have selected. Please let us know if you need further assistance. Happy Framing! I have an oil on masonite painting. How do I get a floating effect? Pic about 10" w by 20" tall, and would like wide frame with lip and an ornate classical look. BEST ANSWER: Hello! This frame is designed to support a Canvas on stretcher bars. The depth/rabbet of this exquisite frame is 1". In order for the Masonite board to work with this frame, the Masonite would need to be close to the depth of 1". Please let us know if you need further assistance. How do you use the D rings to hang pictures? BEST ANSWER: Hello! Thank you for inquiring about our hanging apparatus. The d-rings are screwed into the back of the frame on both sides. Then to secure the hanging wire, simply loop the wire through each d-ring. We have instructions available if you need to see a visual of attaching the d-rings to the back of a frame. Please scroll to the bottom of the website and click on frequently asked questions link. Then scroll to the bottom of the list of questions and click on 'How to assemble a wood frame'. The instructions will be there to provide a visual. If you need any assistance, please let us know. We can be reached at 1-800-332-8884. Happy Framing!